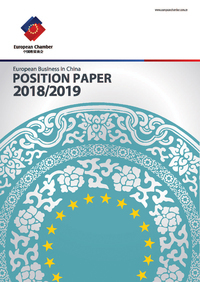 The European Chamber of Commerce in China (European Chamber) released its European Business in China – Position Paper 2018/2019 (Position Paper), which raises concerns about the widening gap between China’s rapidly maturing economy and the shortcomings of its reform and opening agenda. It examines the most significant limitations on European businesses that prevent them from efficiently delivering the goods and services that their customers demand. Tensions in the global economic system have manifested themselves in the U.S.-China trade war, which is now seriously disrupting global supply chains. The root cause is China’s reform and opening failing to keep pace with its rapidly maturing economy, which has created a ‘reform deficit’. The Position Paper provides 828 specific recommendations that the European Chamber believes will help China to overcome this deficit and mitigate outside pressures. The potential for further escalation of the trade war due to the growing impatience of China’s trade and investment partners is reason enough to take a decisive course of action, but China’s domestic concerns also demand progress. While market access and unequal treatment impact international firms, many of the recommendations found in the Position Paper will also benefit China’s own private enterprises – regulatory challenges and ambiguous policies cut into bottom lines and frustrate all market actors. China also needs to address the impact that its state-owned enterprises (SOEs) are having on the private sector, as they squeeze out competition and drain financing from the market. Tackling these serious issues would create a fair and competitive business environment that would attract more high-quality foreign investment, a current priority of the Chinese government. “European companies have for a long time been stifled by the effects of China’s reform deficit, and now they are taking collateral damage from the U.S.-China trade war,” said Mats Harborn, President of the European Union Chamber of Commerce in China. “Creating an open and fair market based on reciprocity will de-escalate this conflict and usher in China’s next stage of development,” according to the European Chamber’s press release.